It’s wonderful to have you here again! 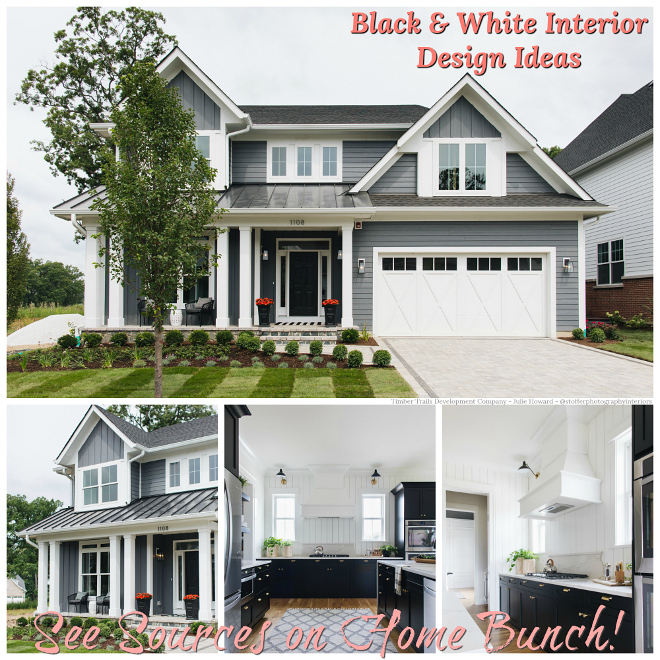 I work closely with the designers, builders and all professionals to share as much information as I can on every house featured on Home Bunch and it’s truly a pleasure to share this newly-built home with all of you. 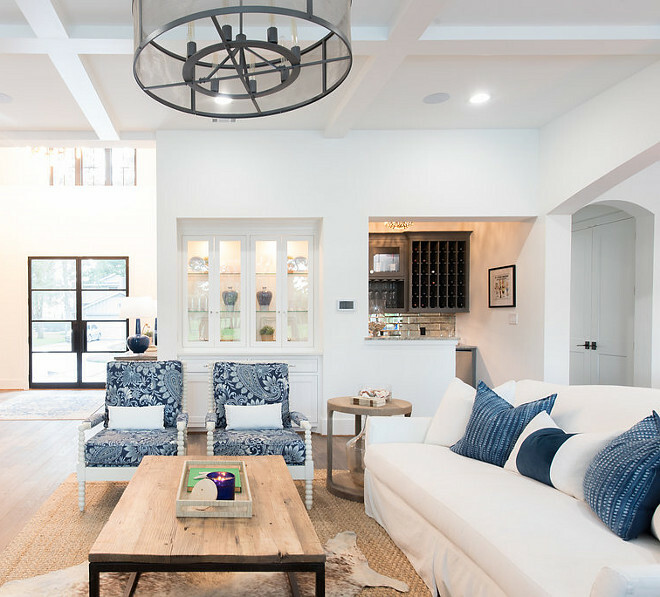 Designed by Wyrick Residential Design and built by Blakecraft Homes, this Houston, Texas, home features plenty of inspiring ideas, starting with its stunning architectural details and its bright and happy interiors. 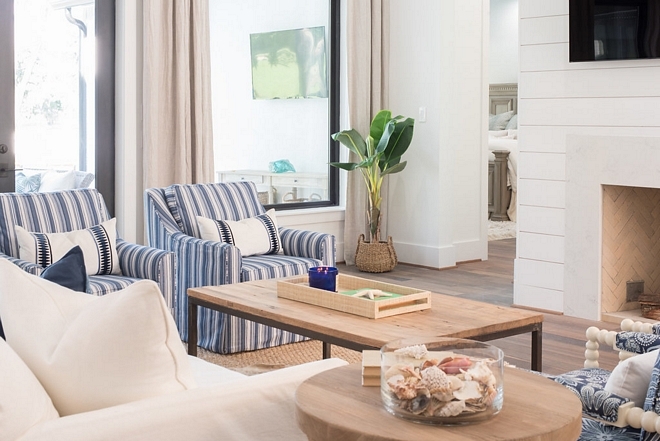 The overall goal for the design direction was to create a modern coastal home. 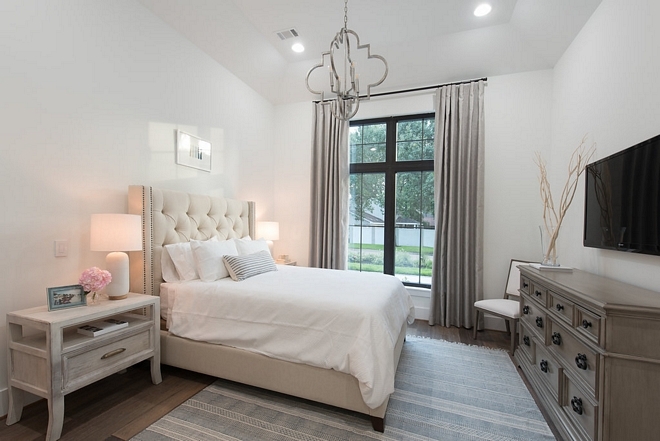 The fabrics and finishes were selected with a light and airy aesthetic in mind. The designer played with texture and color to add interest. The lady of the house is an artist, so they made sure to incorporate interesting art pieces. 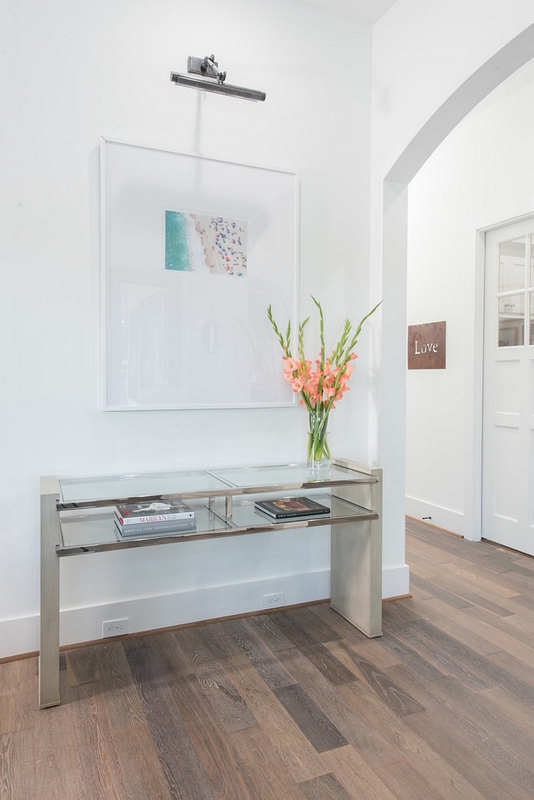 In the dining room you’ll notice a Gray Malin piece. The photo is of The Hamptons which is where the couple met. 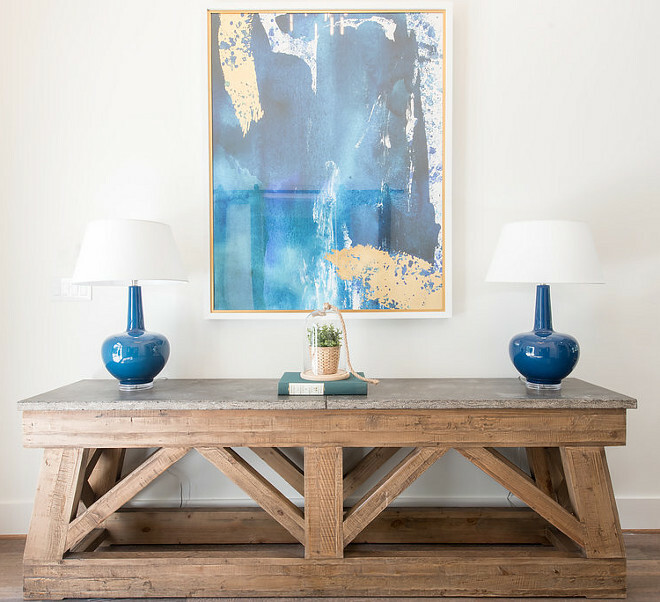 The wife has long admired the artist’s work so the interior designer, Duckworth Interiors, surprised her with the piece on reveal day. 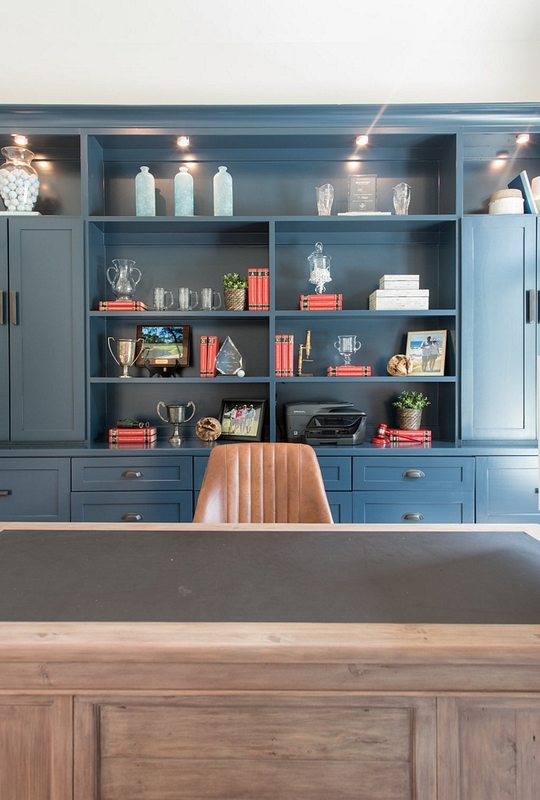 The husband is an avid golfer and his office reflects that. 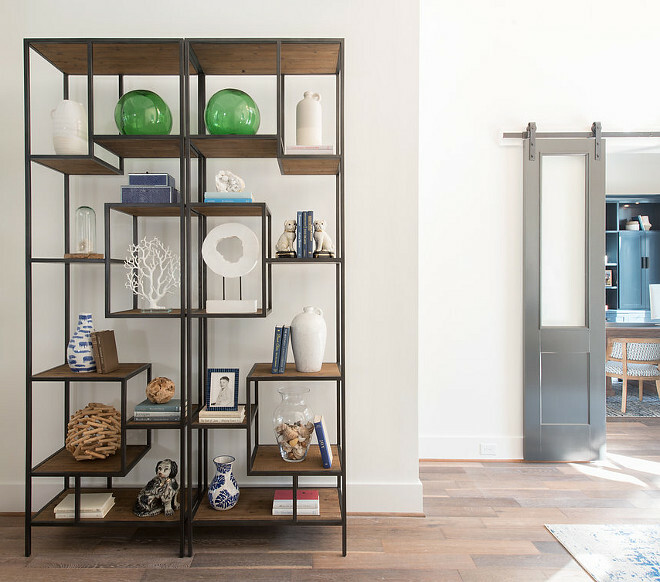 The designer then incorporated all of his golf memorabilia and prints collected over the years and displayed it in a boldly colored built-in. Garage Doors – Amarr Classica 3000 Garage Door – Cortona Design, Closed Square Top Section, White – painted Sherwin Williams SW7969 Iron Ore.
Shutters – Fixed raw cedar Board and Batten. Siding – Front entry, dormer, and second story siding is a Hardi Plank shake painted Sherwin Williams Agreeable Gray. 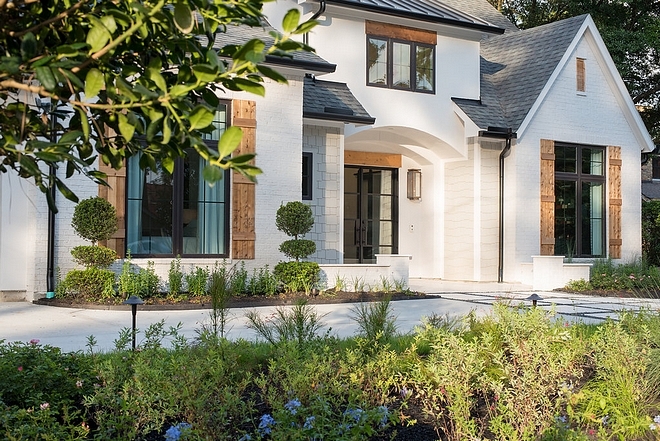 Exterior Brick Paint Color: Sherwin Williams SW7003 Toque White. 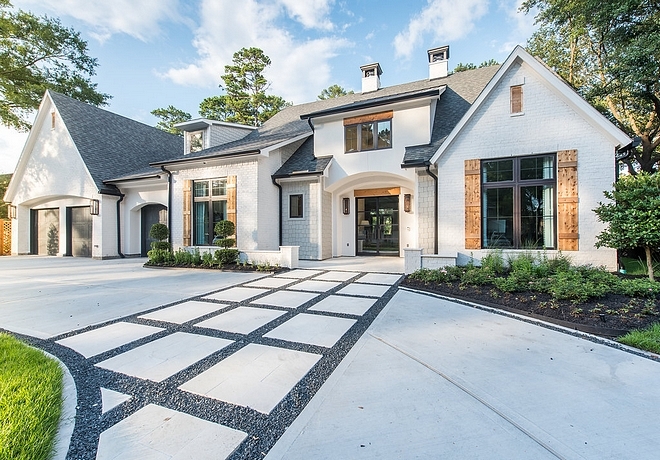 Driveway – The builder, Blakecraft Homes, created drops in the concrete driveway to accommodate our 12”x24” Shell Beach Tumbled Limestone Paver. In this area, they created pads leading to the front door, with a black star gravel that outlines them, along with the entire driveway. 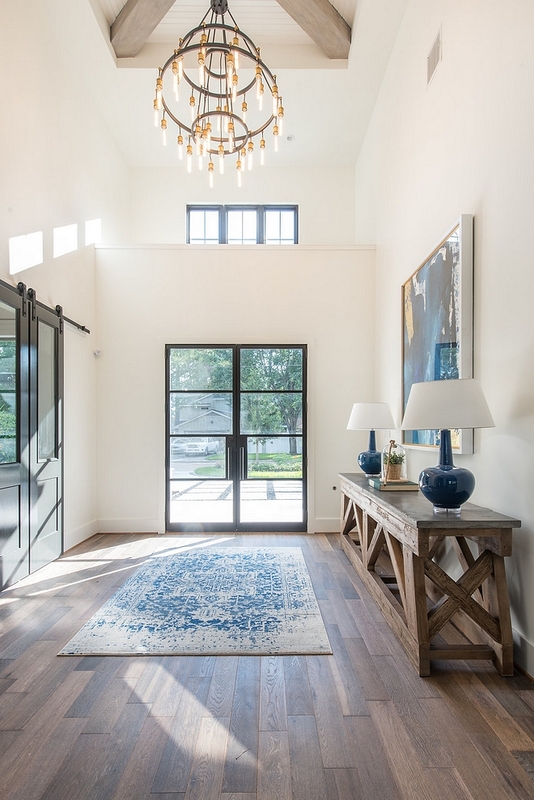 Stunning black steel and glass doors open to an equally impressive foyer. Paint color is Toque White Sherwin Williams SW7003. The home office is located on the left. 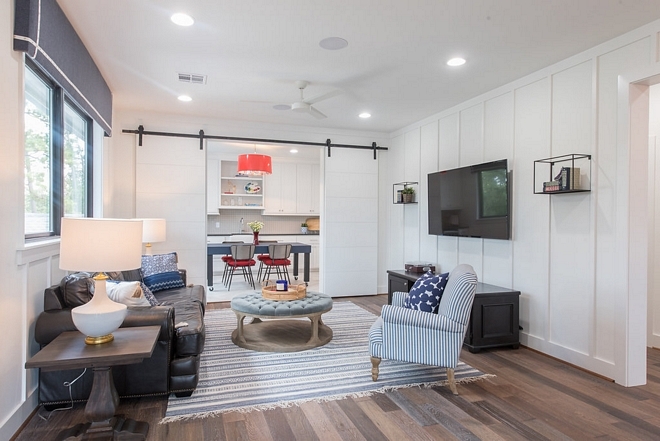 Notice the barn doors. Rug: Here. 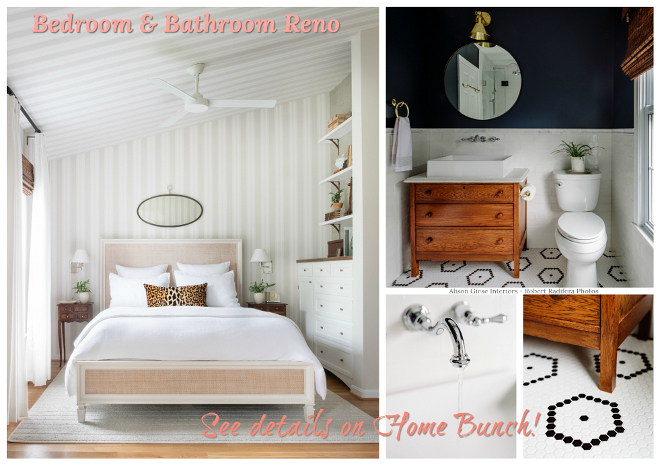 – Similar: Here – Beautiful Vintage Rugs & Runners: Here. 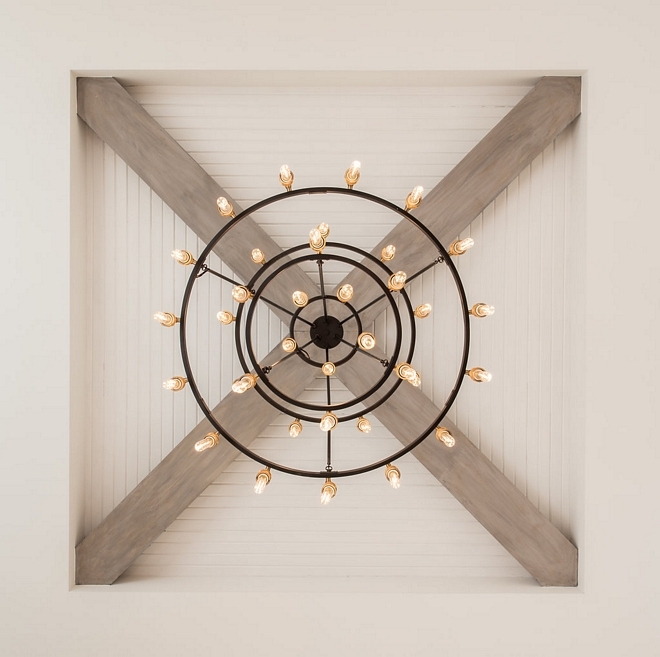 Ceiling Treatment: In the Foyer the builder used a 1×6 tongue and groove to outline the tray ceiling, then created a 6”x10” box beam with a faux finish. What a stunning space! 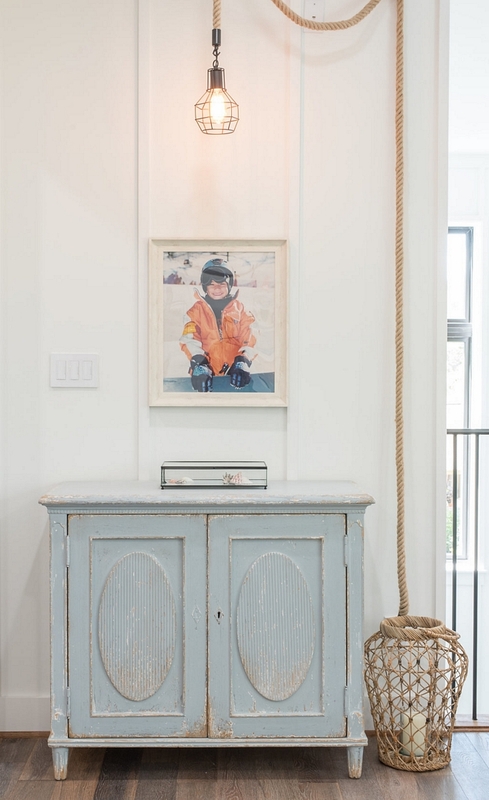 I love the decor, the ceiling beams and the cabinet paint color. Ceiling Fan: Minka60″ Aviation Ceiling Fan in Brushed Nickel with Medium Maple Blades with extension rod. Similar Rugs: Here, Here & Here. 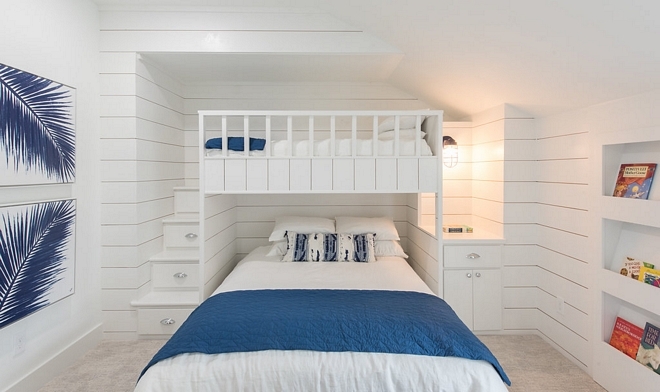 The paint color used on the main floor is Sherwin Williams SW7003 Toque White. 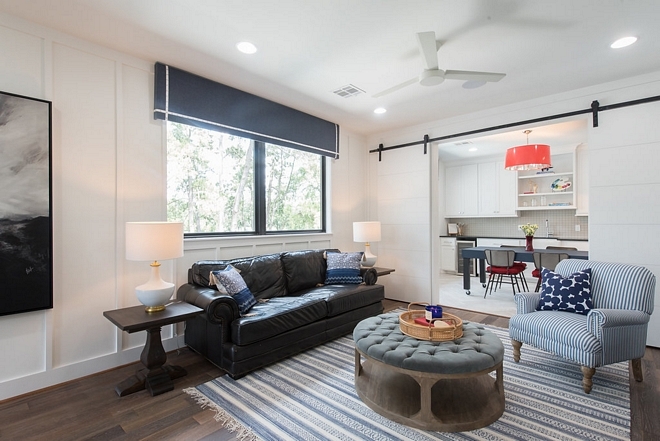 A pair of industrial étagères add personality to this wall. Inspiring Étagères: Here, Here, Here & Here. This is one of the most beautiful foyer I have seen in a while. 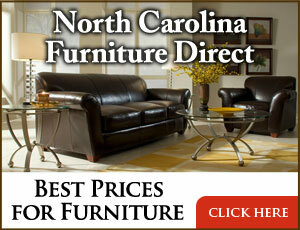 The furniture was all ordered and received by the interior designer. 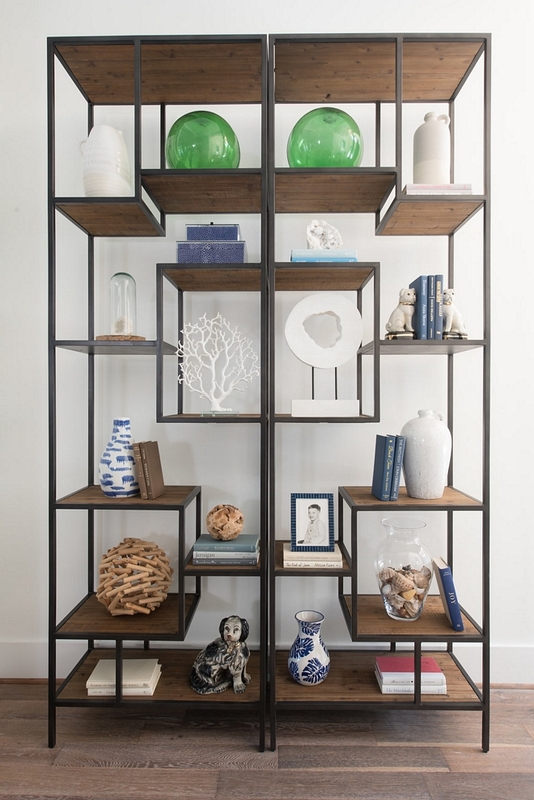 Most pieces were sourced/ordered from their vendors from Dallas Market Center. Hardwood Flooring: Regal Hardwood, On the Nine, Cambridge Avenue 5″ – similar here, here, here (7″). 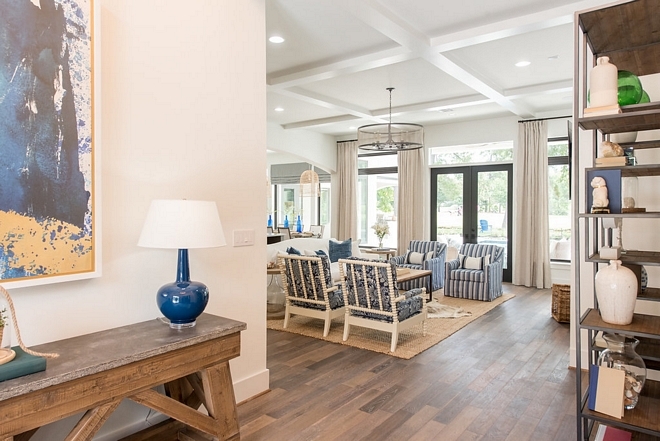 The foyer opens to a beautifully designed living room with boxed beam ceiling and shiplap fireplace. 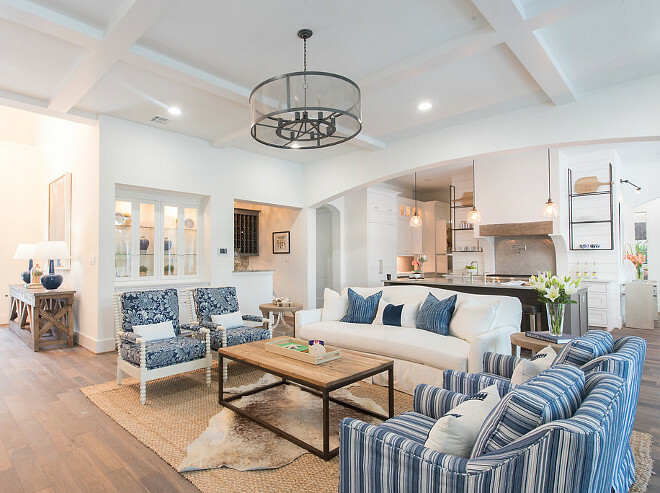 All of the furniture pieces (interior & exterior), drapery and decor were selected and presented to the homeowners by Duckworth Interiors. 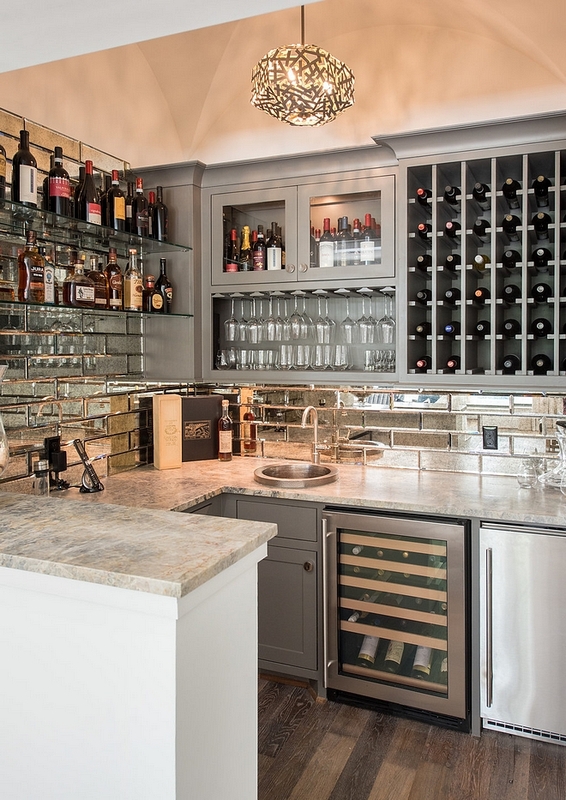 The living room also features a built-in cabinet and an inspiring wine bar. Sofa Pillows: Here – Lumbar: Here. 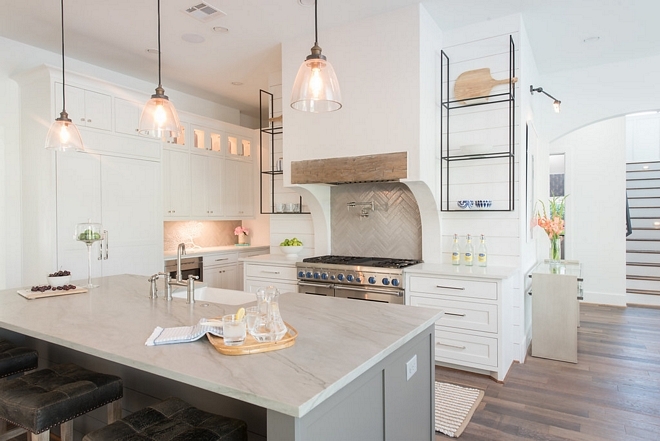 Backsplash: Beveled Mirror subway Tile – similar here & here. 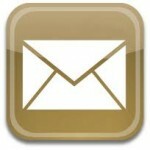 Lighting: Perigold – similar here. Ceiling Treatment: 4”x8” Birch, paint grade box beams. Chandelier: Lighting: RH – similar here & here. 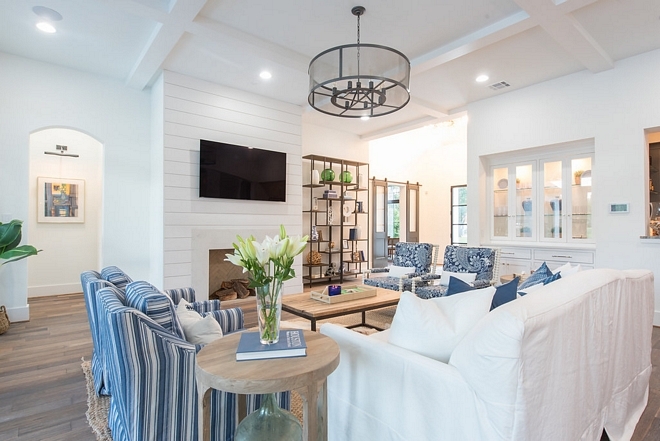 I love the combination of raw wood with the classic blue and white decor. 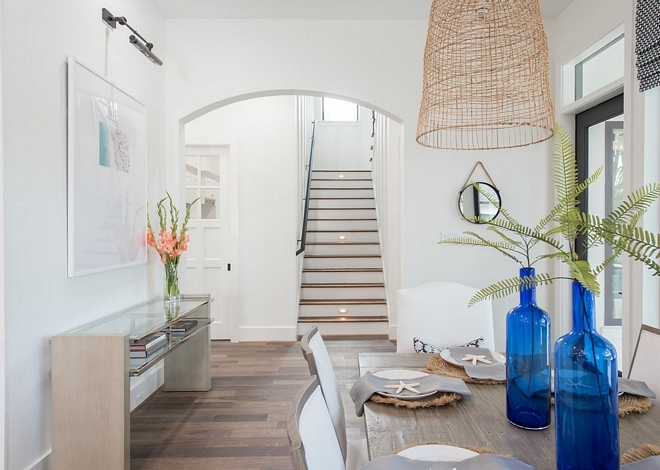 This coastal-chic look is timeless, calming and easy to live with. Similar Coffee Table: Here & Here. Similar Spindle Chairs: Here & Here (The designer used a custom fabric). Blue and White Chairs: Joss & Main with “Bengal Indigo” fabric. Kitchen Cabinet Details: This is a domestic birch plywood cabinet box, with a shaker style Poplar door. 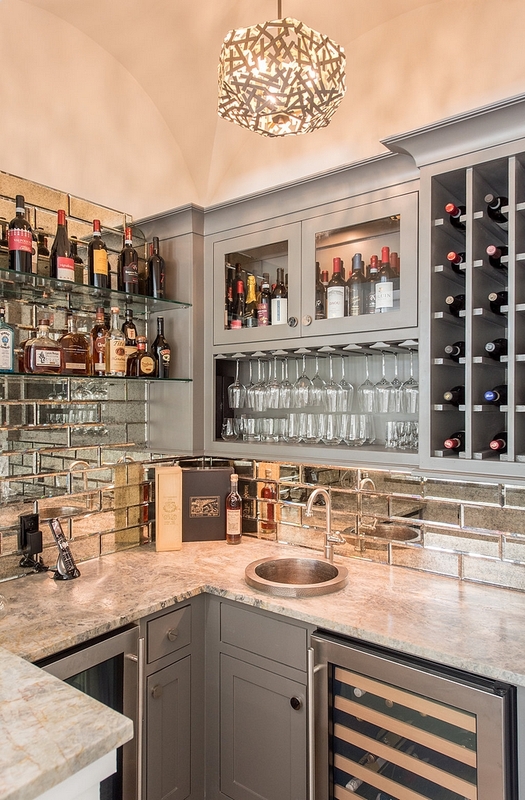 Throughout the kitchen the doors are inset into the cabinet face frame, with soft close hardware throughout. 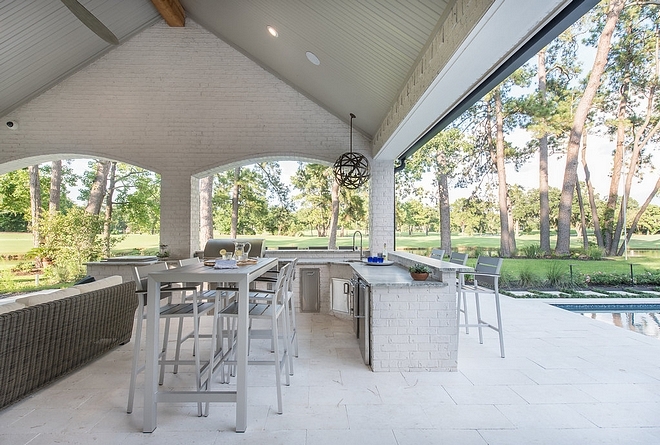 The custom hood is built out of plywood, with a smooth stucco finish over the top. We finished it off with a reclaimed 4×12 piece of lumber from Antique Hardwoods of Louisiana. The shelves on the left, and right of the hood were custom fabricated to fit this spot. 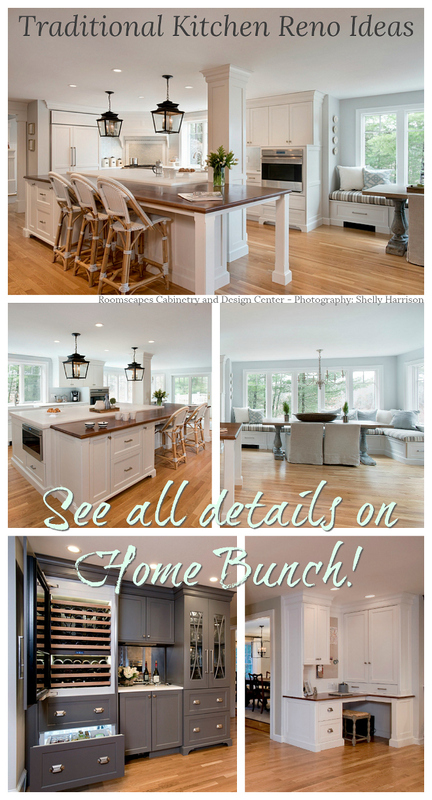 Kitchen Cabinet Paint Color: Sherwin Williams SW7005 Pure White. 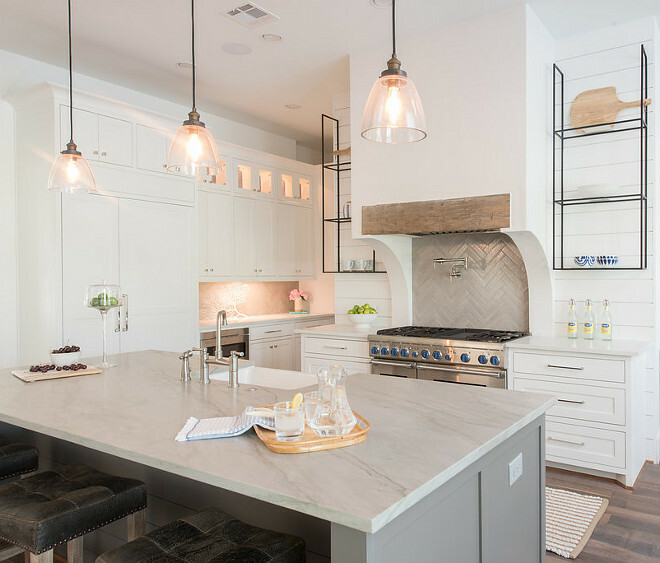 Kitchen Island Countertop: Sea Pearl Satin Quartzite – Flat Polish finish. 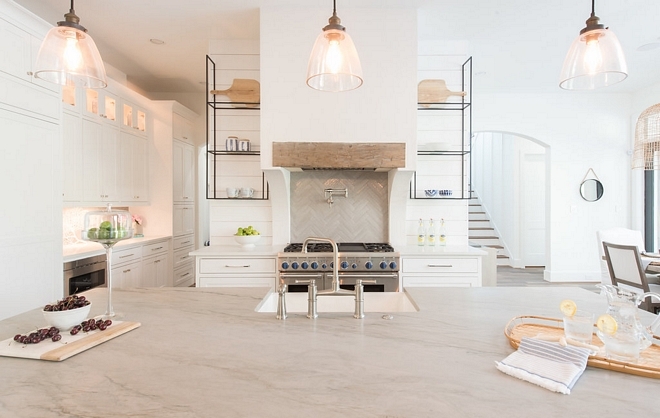 Similar Backsplash Tile: Here – set in Herringbone pattern. Kitchen Faucet: Brizo Bridge Kitchen Faucet. Grey Island Paint Color: Sherwin Williams SW7019 Gauntlet Gray. 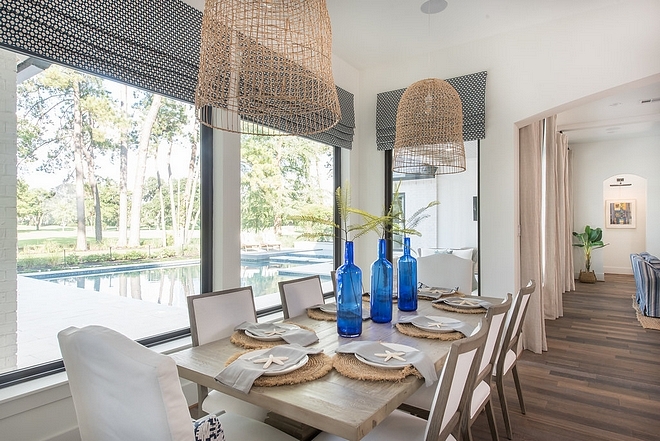 Located just off the kitchen, this dining room feels casual without loosing its elegance. 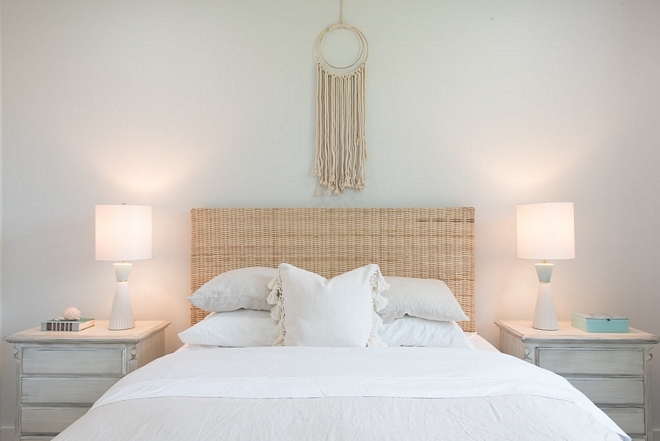 Similar Woven Seagrass Pendants: Here. 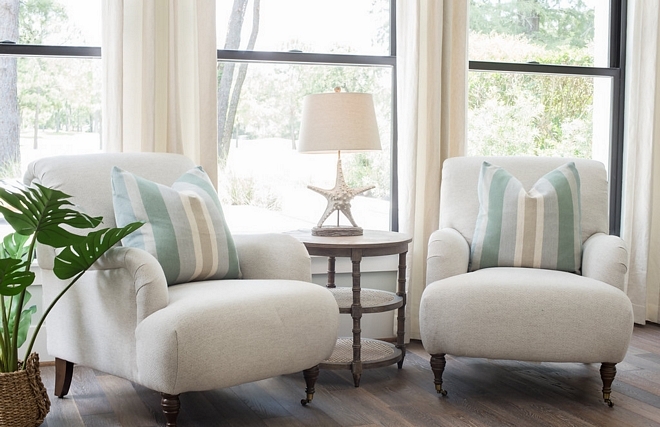 Side Chairs: Gracie Oaks – Similar: Here, Here, Here & Here. 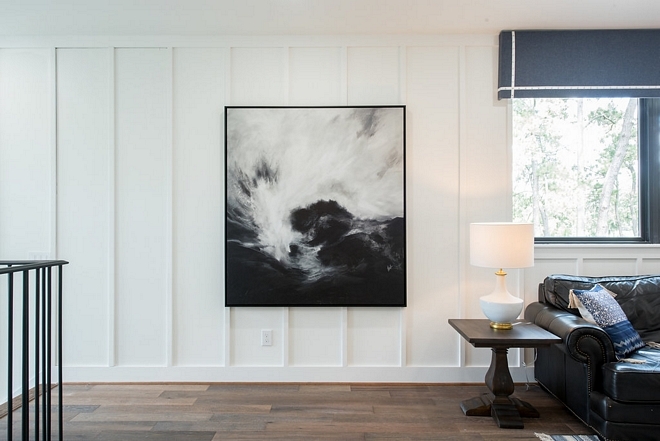 A staircase with board and batten paneling leads to the second level of this home. Notice the beautiful archway. Artwork is by Gray Malin. One of my favorites! 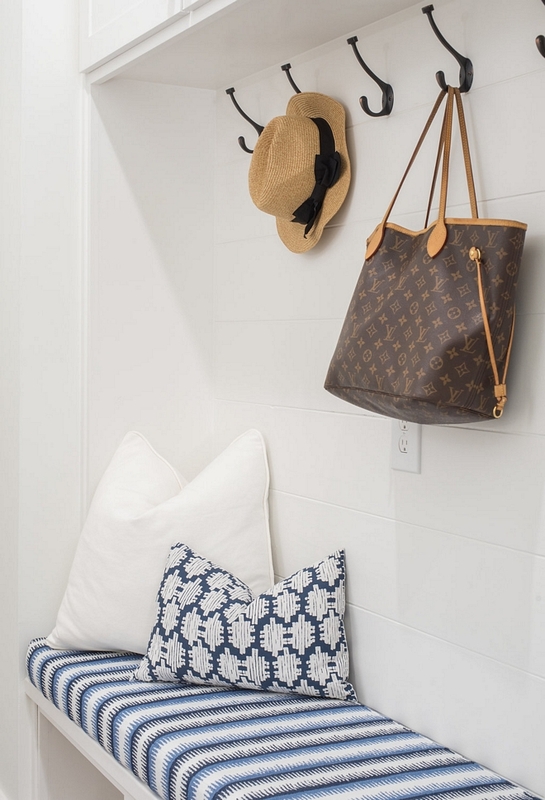 A mudroom is located just off the kitchen area. Notice the pantry door on the right. Sherwin Williams SW7005 Pure White. Beautiful Hooks: Here, Here (set of 10), Here, Here, Here & Here (chrome). I wouldn’t mind doing laundry in this space! 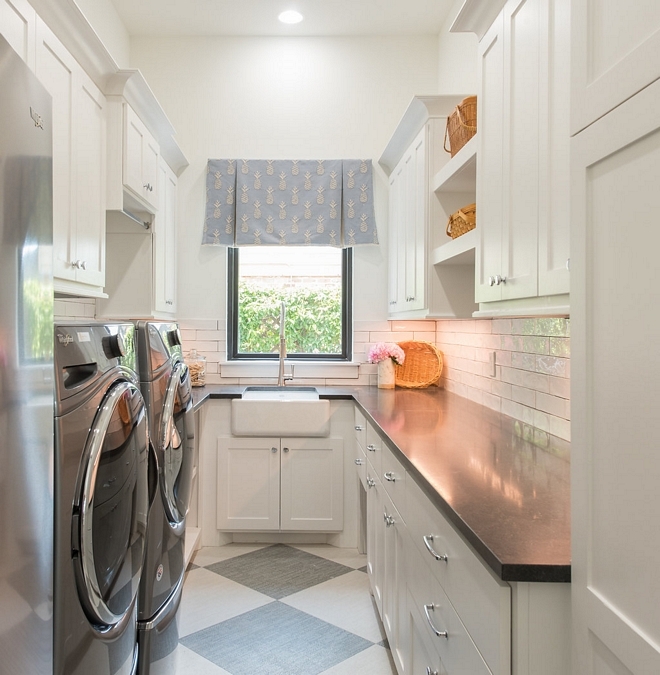 🙂 As you can see, this laundry room is not huge but it’s very well-designed and you have everything you need, from enough storage to plenty of folding space. 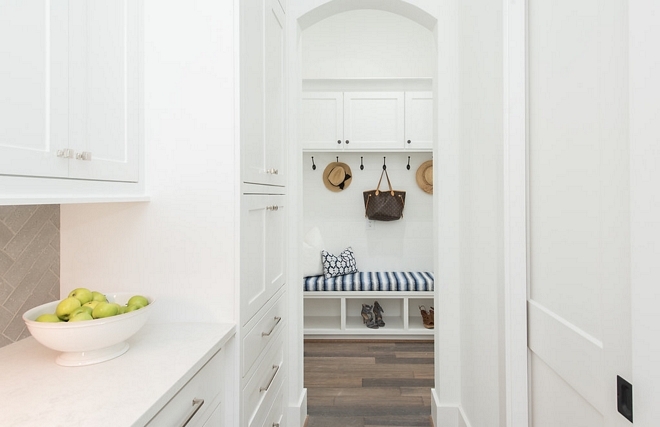 Laundry Room Paint Color: Sherwin Williams SW7005 Pure White. 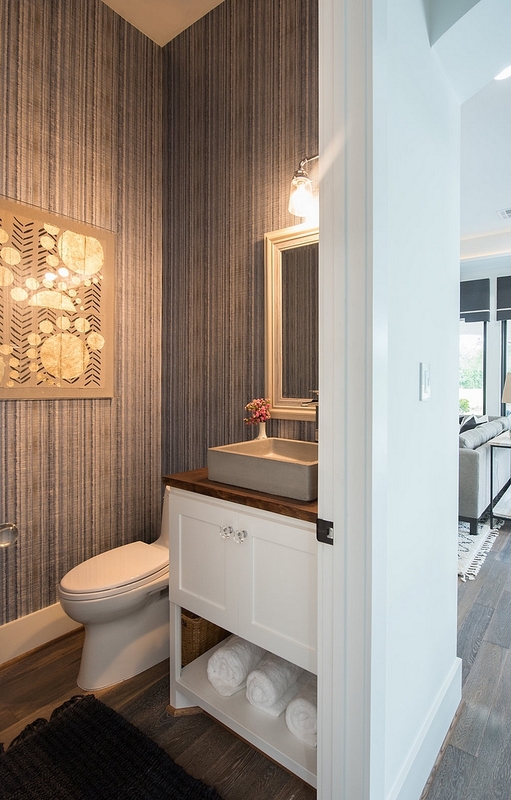 The powder room features a custom vanity with concrete vessel sink and a transitional grasscloth wallpaper. 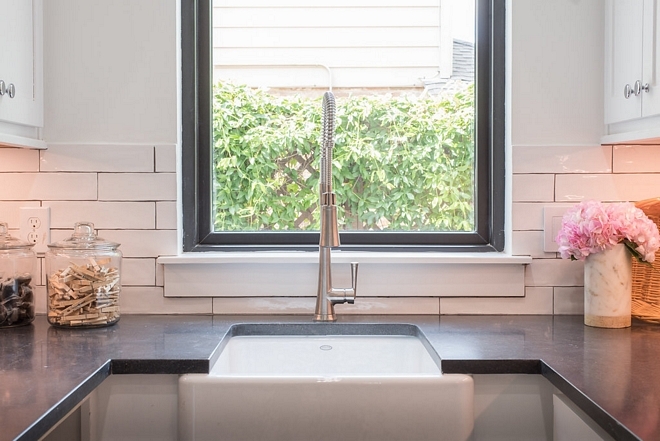 Similar Concrete Vessel Sink: Here. 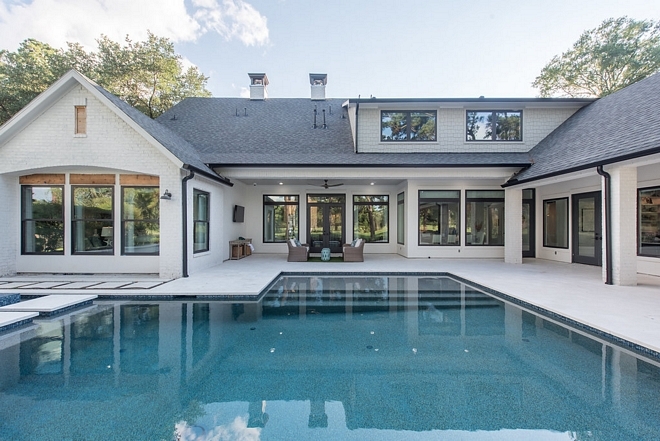 The family room opens directly to the pool and area. 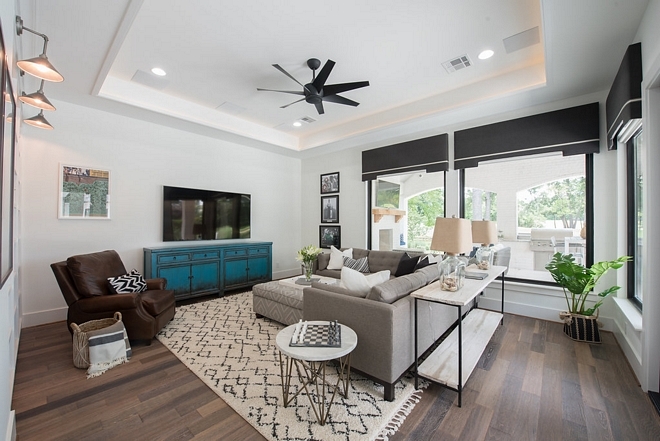 This space is perfect to watch TV and spend some casual time with family and friends. Ceiling Fan: Kichler 54″ ceiling fan. 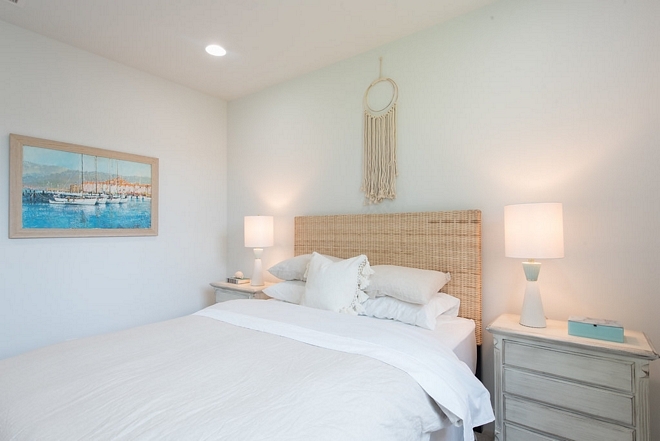 Other Great Ceiling Fans: Here, Here, Here (affordable) & Here (with light). 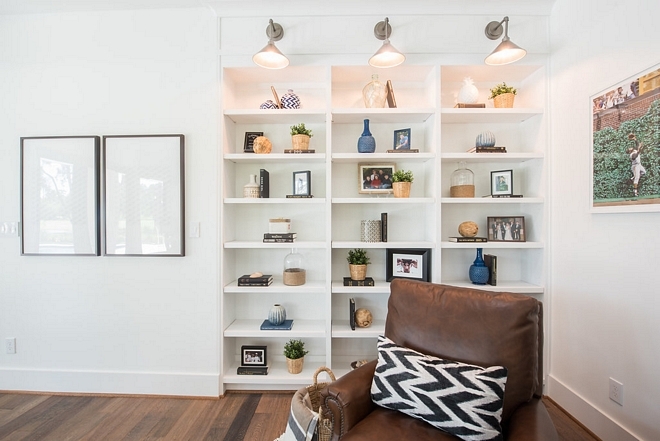 A built-in bookcase becomes the right spot to place family pictures and special keepsakes. Board and batten, trim and walls are painted in Sherwin Williams SW7005 Pure White. What a gorgeous artwork! This really speaks to me. Rug: Wayfair – Similar Rug: Here, Here & Here. Similar Ottoman Coffee Table: Here & Here. 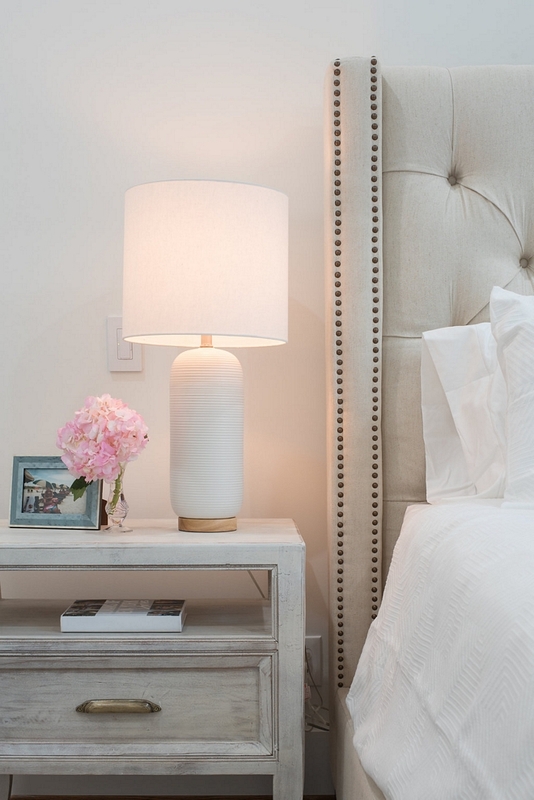 Beautiful Side Tables:Here, Here, Here & Here. 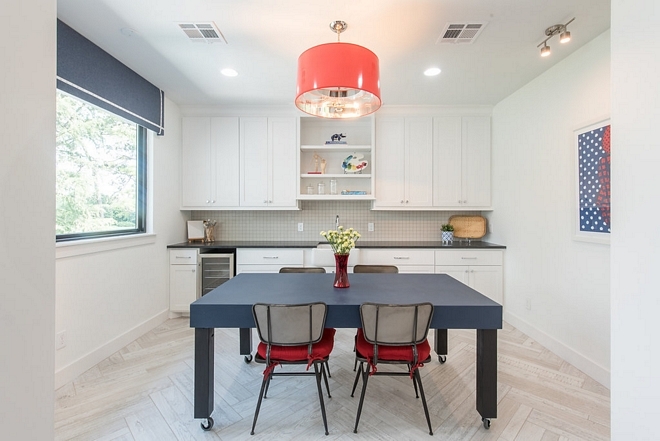 This craft room/art studio features a custom table, custom cabinetry with sink and herringbone flooring. 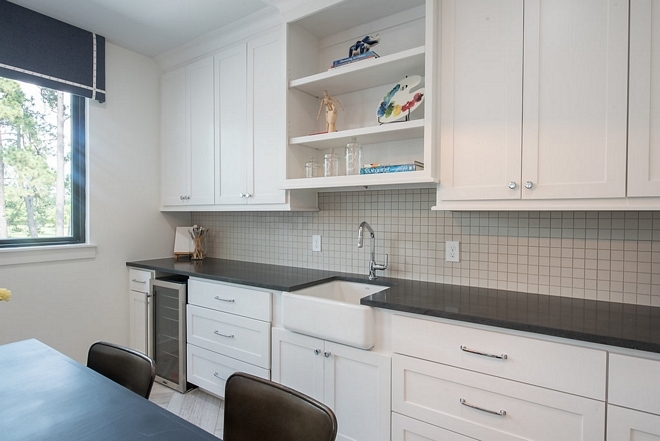 Countertop is Black Mist Honed Granite. 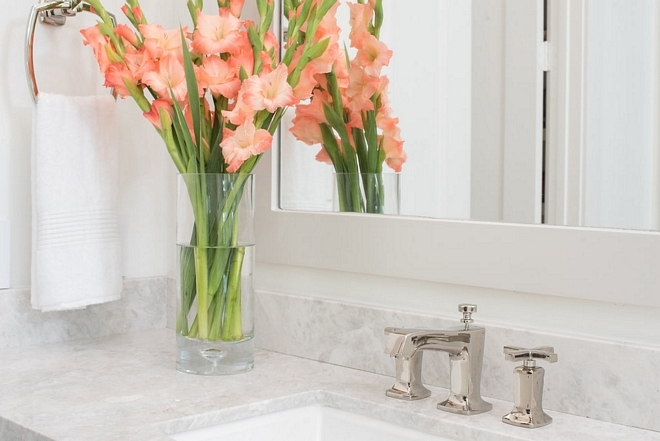 Paint Color: Sherwin Williams Pure White. A home only becomes really special if shared with the people we love. This bunk room is so fun! 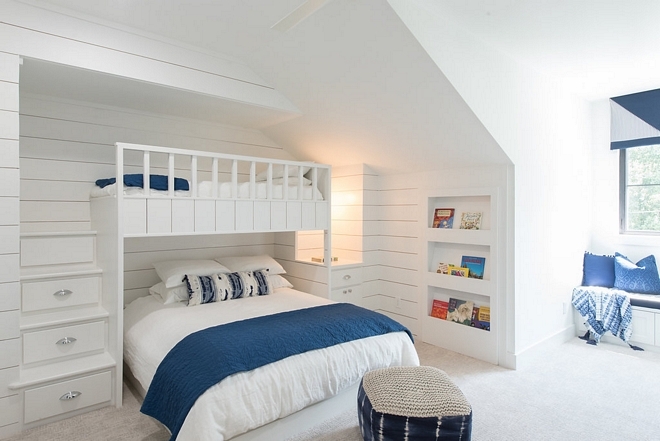 I love the “shiplap” walls and the custom drawer staircase leading to the upper bunk bed. Bedding: Here – Quilt: Here. 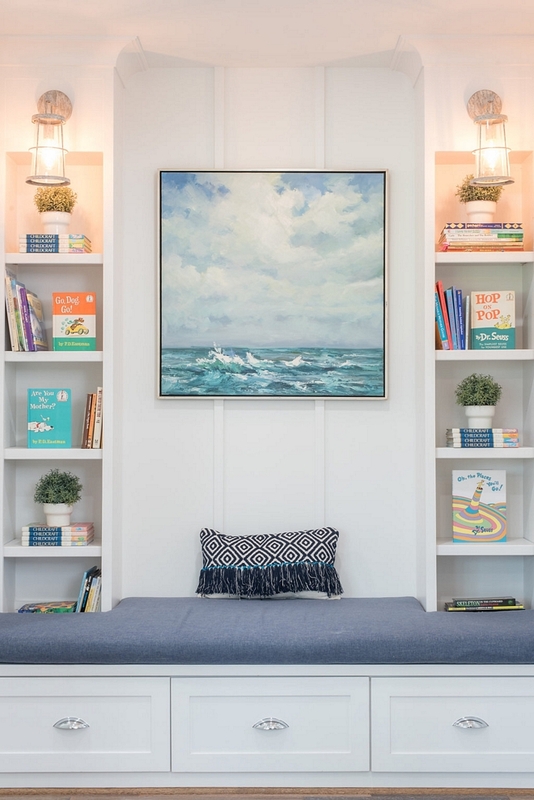 The bunk room also features a custom wall bookcase – see it on the right. Shower Floor Tile: White Penny Round Tile – matte white. 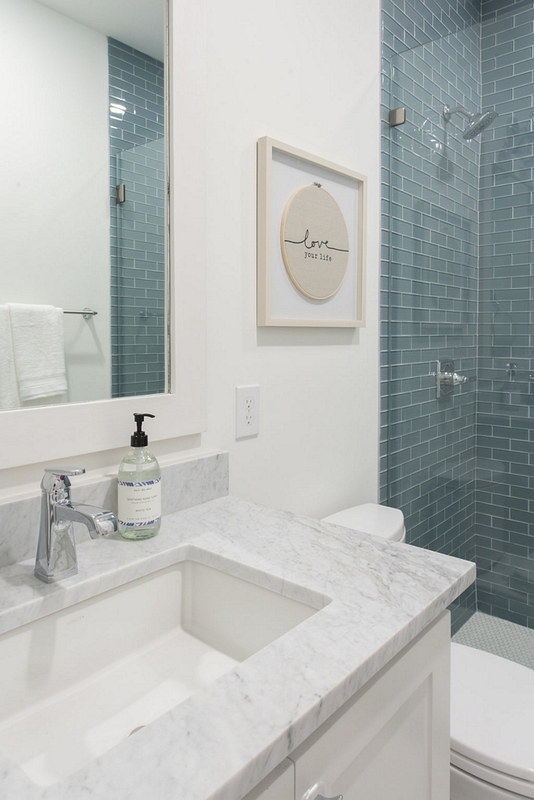 Shower Wall Tile: Pure Spa Blue Tile – similar here, here & here. 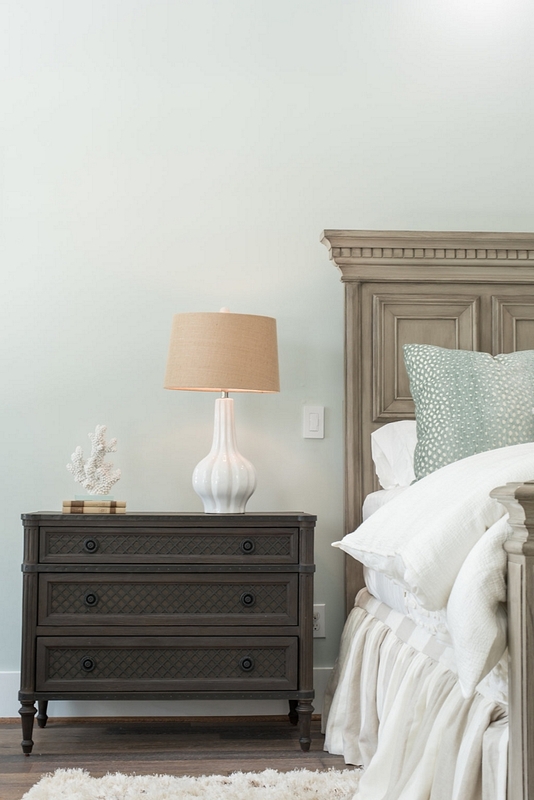 I feel relaxed just looking at this neutral bedroom… so simple and pretty! Similar Headboard: Here, Here & Here. Paint color is Sherwin Williams Nebulous White. 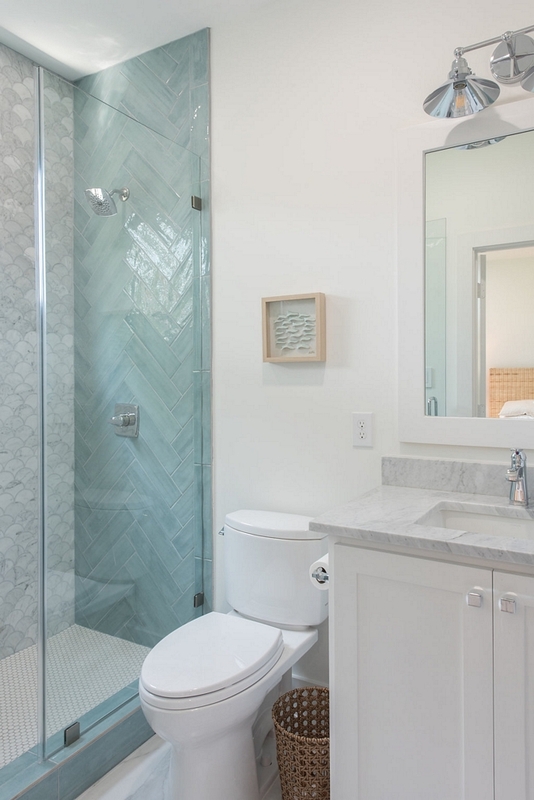 The tile combination in this bathroom is beyond inspiring! Lovely! Shower Tile: White Penny Round Tile – matte white. 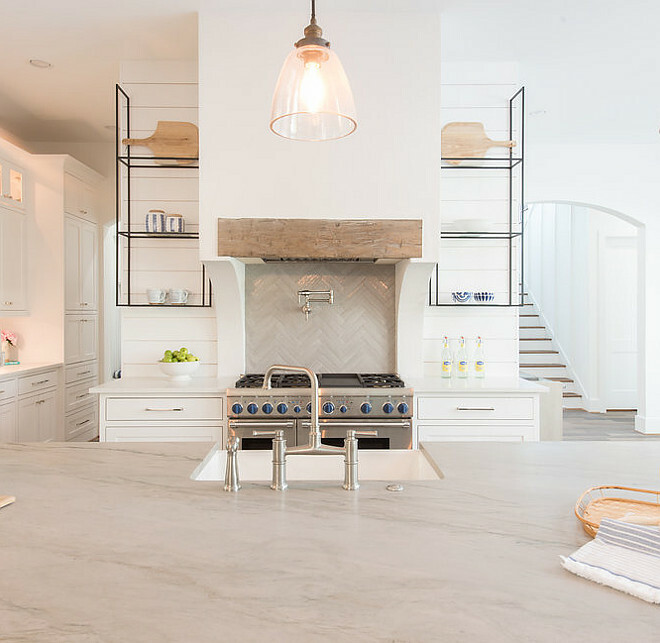 Herringbone Tile: Floor & Decor Seaside Polished Ceramic Tile – similar Here. Similar Marble Fan Accent Tile: Here. 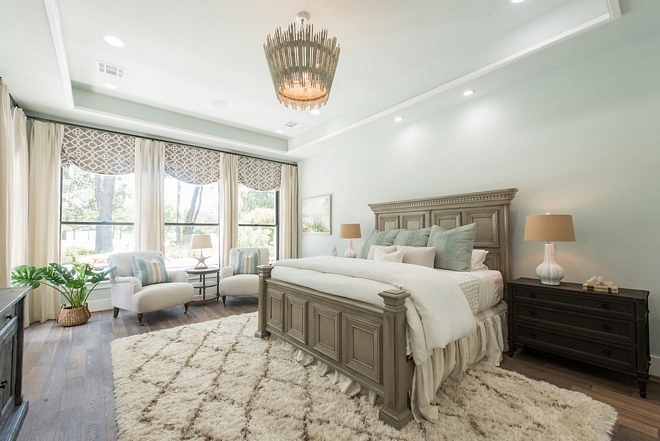 This beautiful chandelier is by Capital Lighting. Sherwin Williams SW7063 Nebulous White. 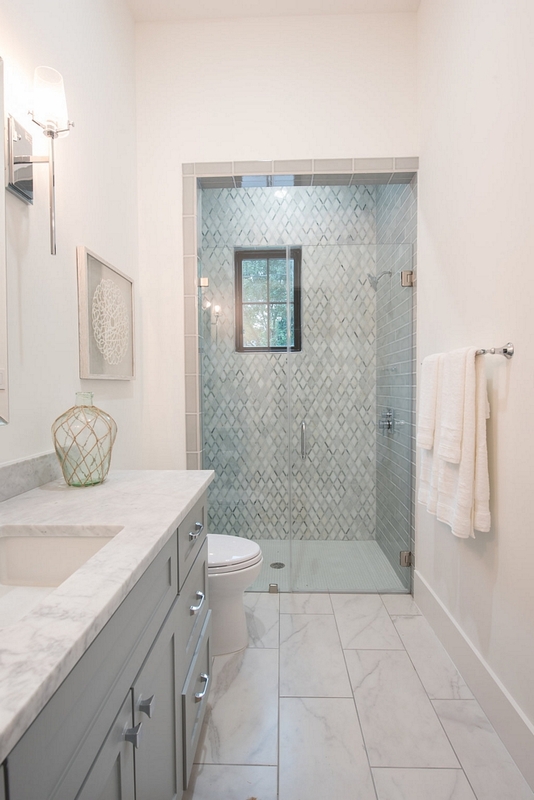 Shower Tile: Carrara White Caribbean Green Diamond Marble#100151770 – similar here. Floor Tile: 12 x 24 Versailles Chateaux Ivoire Natural – similar here. 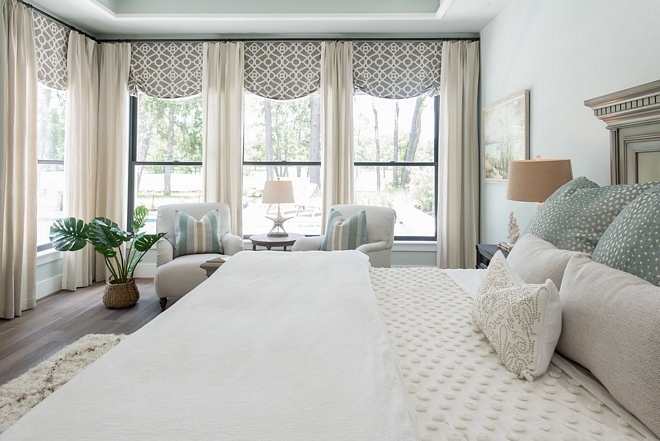 A soothing color scheme and plenty of soft textures make of the master bedroom a retreat! 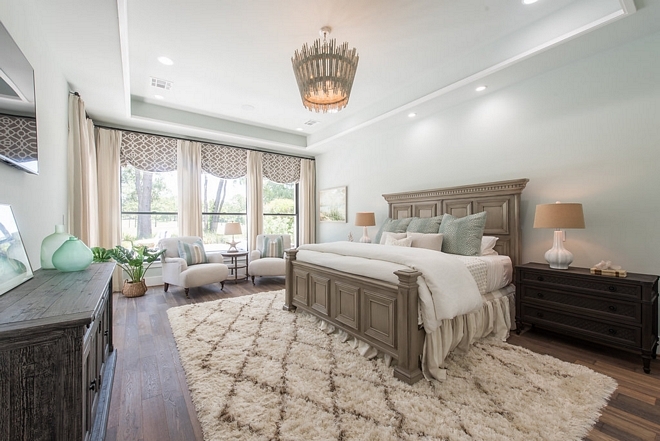 This bed is timeless and elegant. 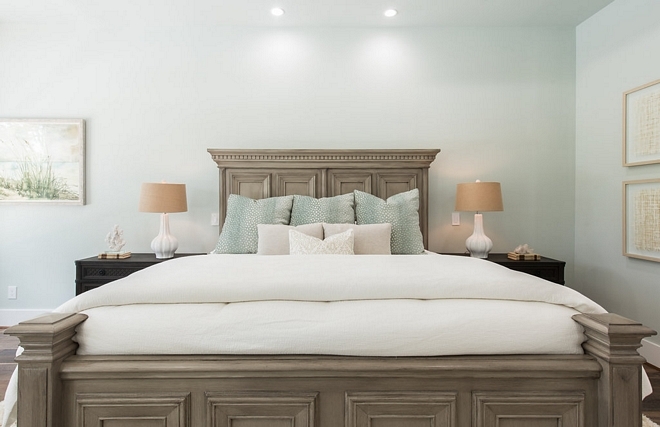 Beautiful Beds: Here, Here, Here, Here, Here & Here. 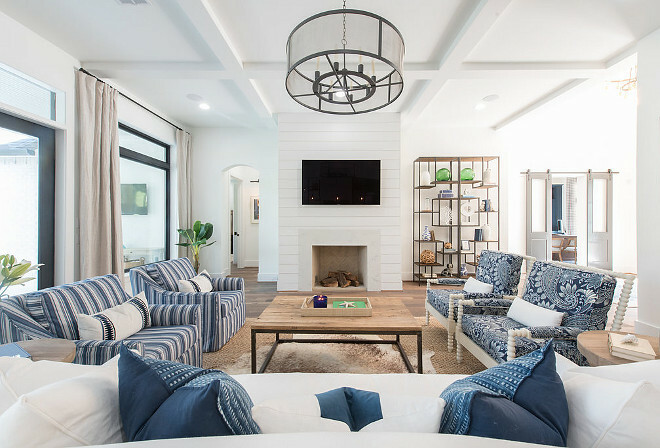 The decor is beautiful and not cluttered, which is a huge plus for me. The drapery was custom-made for the project. The sitting area is perfectly designed and very inviting. Paint color is Sherwin Williams Seasalt SW6204. Similar Rug: Here, Here & Here. French doors open to the master ensuite. 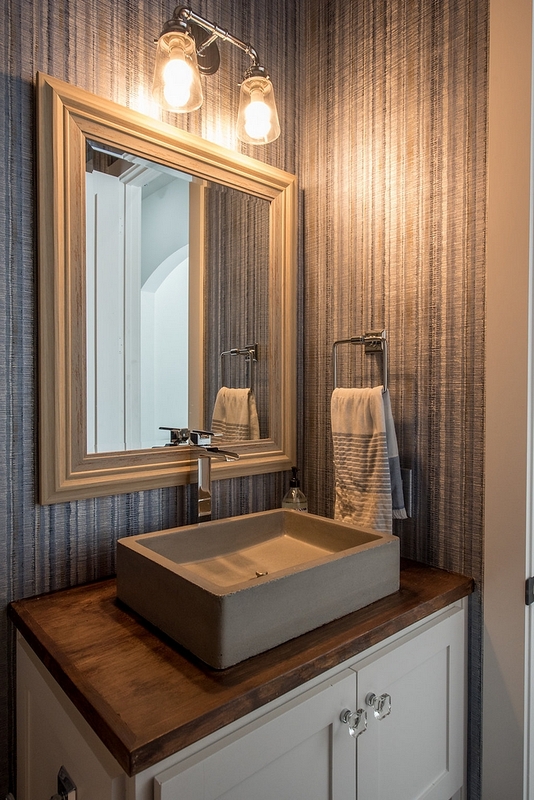 The master bathroom has a very chic-European feel. I also like the idea of having the shower tucked away from the main space. 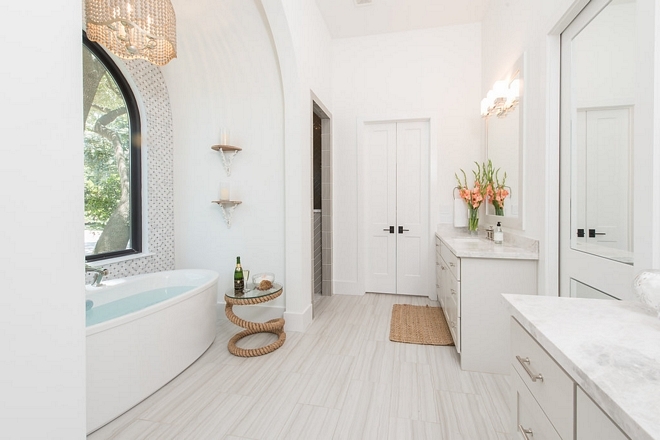 The arched bath nook truly is the focus point of this gorgeous bathroom! Wall Tile: Floor & Decor White Flower Mosaic – similar here, here & here. 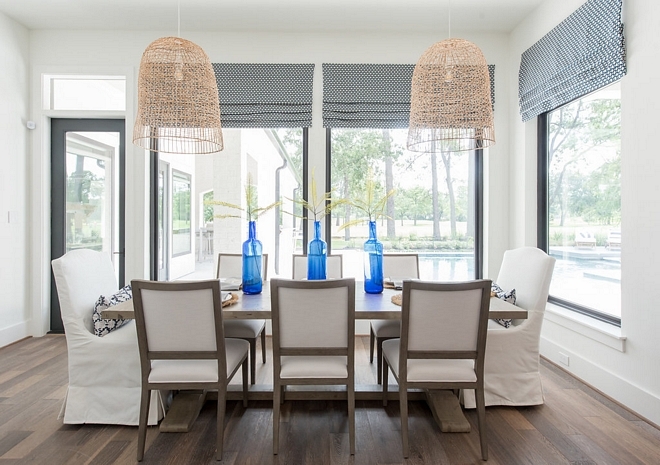 Chandelier: Here – Other Beautiful Beaded Chandelier: Pottery Barn. 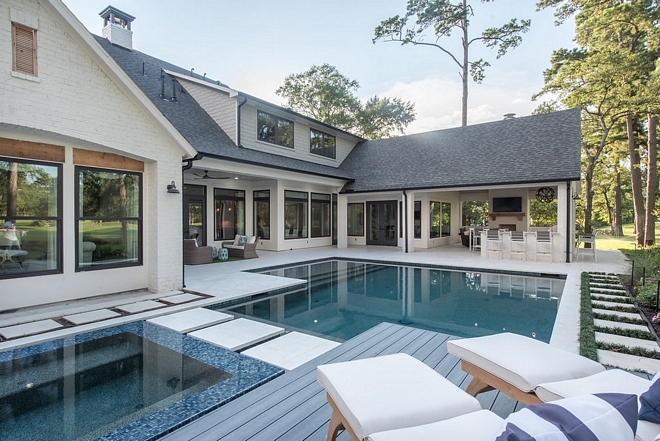 This home doesn’t disappoint – it was perfectly designed and built from every angle. 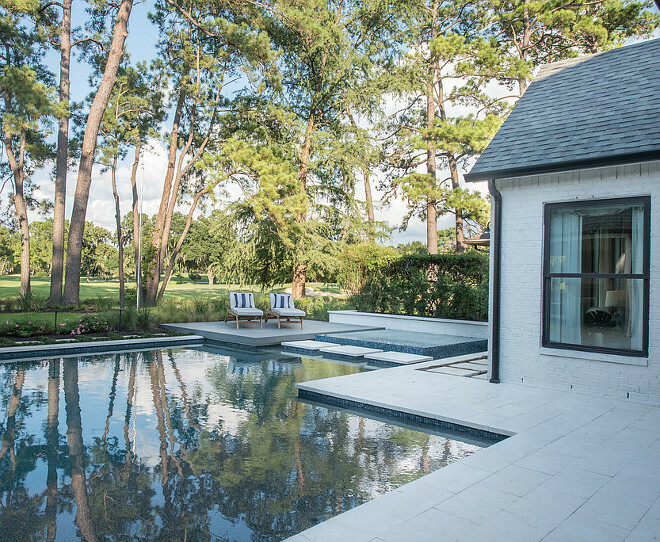 Perfect combination of architectural details are carried from the home to the pool design. 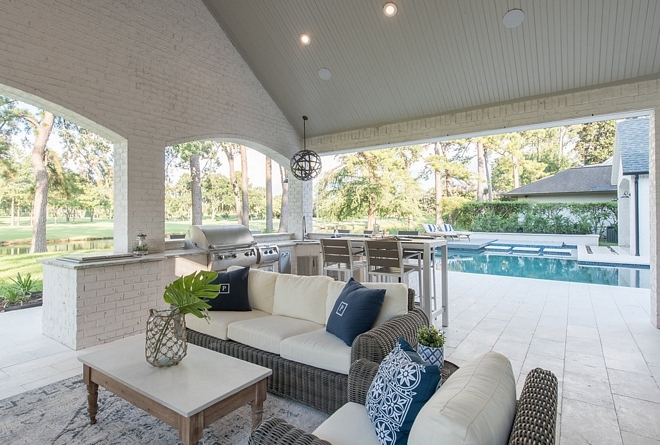 Patio Ceilings – 1”x6” tongue and groove, painted Sherwin Williams Agreeable Gray. Ceiling Fan: Monte Carlo Maverick 60″ ceiling fan Aged pewter. Outdoor Kitchen Countertop: Fantasy Brown Satin Quartzite. 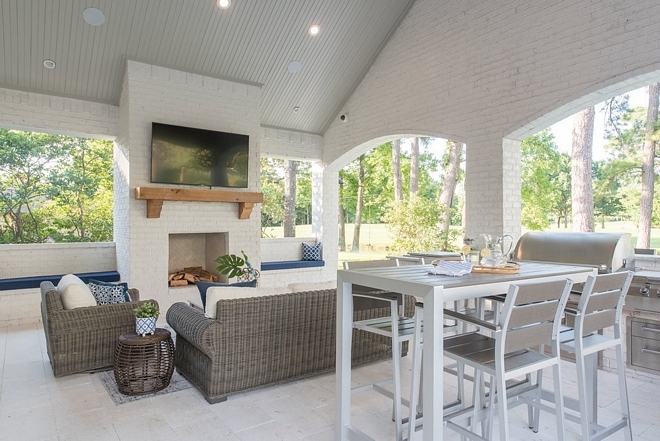 The outdoor brick fireplace (and remaining walls) is painted in Sherwin Williams Toque White. 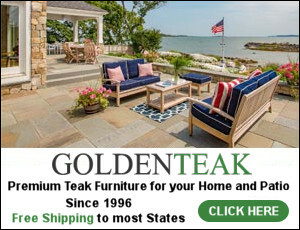 Pool Deck – 12”x24” Shell Beach Tumbled Limestone Paver. For our flat floating deck platform we used a composite decking material supplied by NewTech Wood in a charcoal selection. 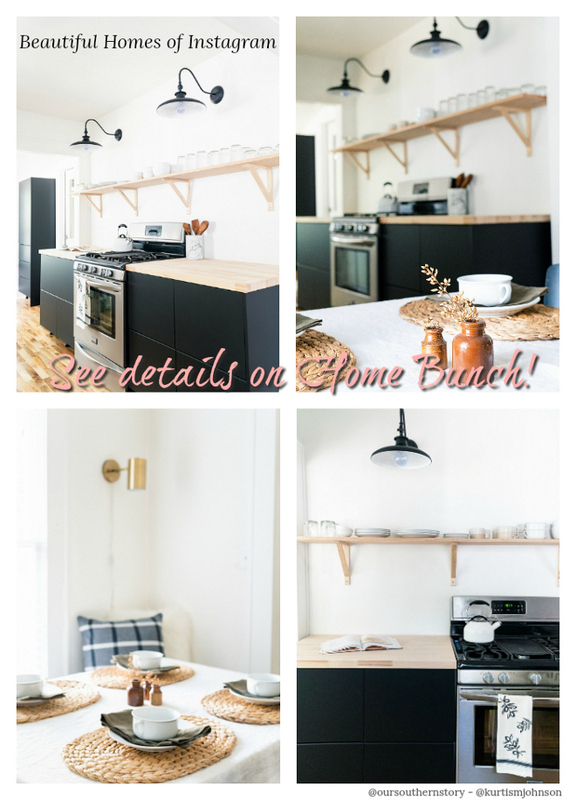 Many thanks to the architect, builder & interior designer for sharing the details above! Make sure to check them out. 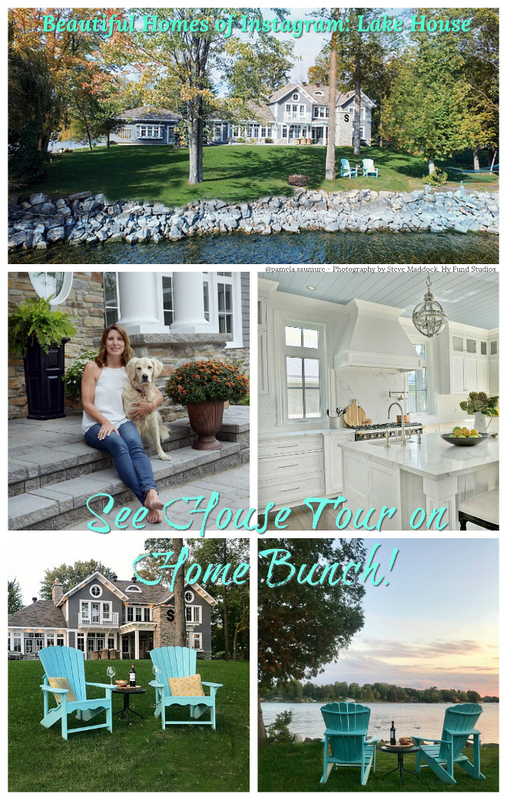 I also want to the thank the homeowners for this house tour!